How to become a Pharmacy Technician – Pharmacy technicians complete a majority of the tasks and duties that are required to successfully operate a pharmacy. The only things that they can’t do are the final check on everything or counsel patients, which has to be done by the licensed pharmacist. Those that work in a pharmacy that aren’t pharmacy technicians and are just aides usually work more on clerical work, where a pharmacy technician is really the only one that gets to assist the pharmacist in filling prescriptions. The demand for pharmacy technicians is strong, and shows no sign of letting up anytime soon. Although a pharmacy technician won’t be able to be called a pharmacist, they still enjoy many of the perks that a pharmacist enjoys. The great works schedules, job security, and things of that nature. But, the educational requirements for a pharmacy technician are far less than that of a pharmacist. The salary is also less than that of a pharmacist though, which is really the only trade off. Plus, a pharmacy technician is different from a pharmacist in the since that they are going to be supervised while they fill prescriptions from start to finish by a pharmacist that is licensed. Everything has to be double checked by a licensed pharmacist before completion. The vast majority of people that work as a pharmacy technician are going to work in a retail setting, but that is not the only place that they work. Pharmacy technicians are also employed in hospitals, assisted living centers, mail order pharmacies, and even with the federal government. There are even advancement opportunities in larger organizations for those that have the experience and training. Some pharmacy technicians actually specialize in a certain area like chemotherapy, or they go on to further their education and become licensed pharmacists. The population is continuing to grow and the average age is climbing, and new drugs are being discovered every day. This means that the demand for pharmacy technicians is going to remain strong. In the decade between 2008 and 2018, the Bureau of Labor Statistics reports that the positions for pharmacy technicians will climb 31%. 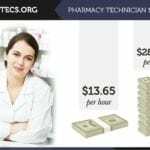 The average salary for pharmacy technicians in 2009 was $32,300 a year. That is going to depend largely on where you are working, considering some states have significantly higher costs of living and wages. The first thing you want to do is to make sure that you are taking Math, Science, and English courses. You also want to make sure that you are excelling in those classes as well. Pharmacy technicians need all of the skills taught in these classes on a daily basis, and most Pharmacy Technician Schools require at least a High School Diploma as a prerequisite to enroll in a their pharmacy tech program. Then you can move on to look at the requirements for your State board of pharmacy. At the moment there are no federal regulations when it comes to pharmacy technicians, but there still are a lot of state requirements depending on which state you live in that you will have to meet. Your next step would be to attend a school that has a program that offers pharmacy technician training. 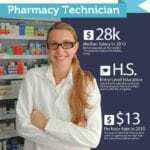 Even if your State doesn’t require this, it is still a great way to make sure of your success as a pharmacy technician. Plus, it will make getting hired a lot easier. Then finally you can take the certification exam, which is offered by quite a few organizations, ICPT and PTCB being the two that are recognized the most by a majority of the great states. Once you take this and pass it, you will be able to move on to on the job training. My first piece of advice to a successful career as a pharmacy technician would be to continue your education. Medicine is an ever changing world of information and you need to be able to stay on top of it. Plus, you can even head towards becoming a pharmacist later in life with your continuing education. Bring on the responsibility! Those pharmacy technicians that take on more responsibility are going to take the pressure off of the pharmacist that works there and really make for a happy work place from top to bottom. It is also important to have a positive attitude and great customer service skills. After all, you are going to be working with people on a daily basis that might not be in the greatest mood. It is your job to not only fill their orders that were prescribed to them, but it is also your job to make their experience at that pharmacy a good one. Attention to detail is the last thing I will suggest, as this job requires a lot of specifics that can’t really be messed up.